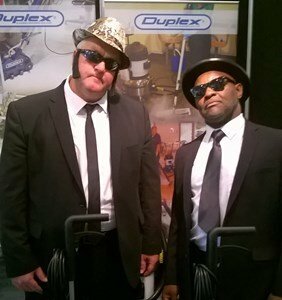 Our picture shows Duplex’s own Blues Brothers, Mike Conroy and Barry Wilmot appearing at the AHCP National Conference at East Midlands Conference Centre this week. They were singing the praises of Duplex, not the blues as they showcased machines from the Duplex range of premium floor cleaning and steam cleaning machines. So if you “Think” you’ve got floors to clean Duplex machines give you the “Freedom” to clean any types of floor.